Projector People has more than 20 years of experience in the audiovisual industry. We put our experience to work for you finding the right projector, providing impeccable service, and offering the best values today and for the future. We carry over that experience to our e-commerce web site, launched January 1, 1999 and now a successful multi-million dollar company. 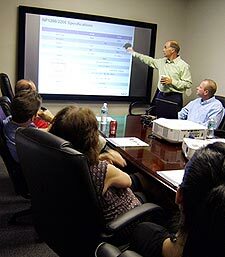 Our projector experts receive ongoing training and are among the most knowledgeable in the industry. Frequent collaboration directly with top manufacturers ensures that our projector experts are familiar with new product releases and the latest technology. ...and many other brands you know and trust. Projector People.com carries more projector models than any other reseller. We stock thousands of projectors in our warehouse everyday so that we can offer you the best of all worlds — a competitive price, fast delivery	and	the best service in the industry. In today's complex business environment getting your message seen and remembered could make or break your success. Get on the road to effortless and dynamic presentations with the right tools from Projector People. Your next successful presentation is just a click away!